This study describes the aetiological agents of vibriosis outbreaks in cultured sea bass, Dicentrarchus labrax, L. from four different farms in the Aegean region of Turkey. Diseased fish were characterized by lethargie, exophthalmus, ulcers and skin lesions, haemorrhagies in the internal organs, ascites, paleness of kidney and liver. Morphological, physiological and biochemical tests were used to determine the phenotypic properties of pure cultures of isolated colonies in the samples taken from the internal organs and blood. Aquarapid-Va diagnostic kits and Mono-Va agglutination kit were also included in the study. The principal histological change was massive deposition of haemosiderin in the melano-macrophage centers in the spleen tissue. Vibriosis is an important disease in some commercially important fish species including cultured European sea bass (Dicentrarchus labrax), gilt-head seabream (Sparus aurata), silver sea bream (Sparus sabra), snarpsnout sea bream (Puntazzo puntazzo), red porgy (Pagrus pagrus), sole (Solea senegalensis), turbot (Scophthalmus maximus) and Atlantic salmon (Salmo salar). The outbreaks have been reported in several countries including China, Greece, Spain, Venezuela, Israel and Turkey (Korun and Gokoglu, 2007; Yiagnisis et al., 2007; Demircan and Candan, 2006; Tanrikul et al., 2004; Villamil et al., 2003; Zorrilla et al., 2003a; Zorrilla et al., 2003b; Li et al., 1999; Cagırgan and Yurekliturk, 1996; Colorni et al., 1981). Generally, the term ‘vibriosis’ has been used to define Listonella (Vibrio) anguillarum infections (Ghittino et al., 2003). However, other members of the genus Vibrio, e.g. V. alginolyticus, V. ordalii, V. salmonicida, V. harveyi and V. parahaemolyticus, were also isolated from diseased fish (Toranzo et al., 2005; Austin and Austin, 1999). The purpose of this study was to identify the aetiological agents of vibriosis outbreaks in the European sea bass cultured in four different farms located in the Aegean region of Turkey and examine the histological changes produced by naturally acquired infections of L. anguillarum, V. ordalii and V. harveyi in the moribund fish. Two epizootics (E1 and E2) at four different sea bass farms (F1, F2, F3 and F4) in the Aegean region of Turkey were observed in January and May 2003 when the water temperature ranged between 19°C to 22°C. The daily mortalities in these farms were 10%, 15%, 9% and 12%, respectively. Affected fish (25 fish) were obtained from marine cages at F2, F3, F4; in the case of F1, moribund fish were taken from indoor tanks. Before microbiological isolation, the fish were anaesthetized with 1.5 ml 2-phenoxyethanol (Fluka, Switzerland) per 1 L sea water. Samples taken from kidney, spleen, liver and blood, and streaked onto tryptic soy agar (TSA-S) (Merck, Germany) supplemented with 2% NaCl and brain hearth infusion agar (BHIA-S) (Merck) supplemented with 2% NaCl. The inoculated media were incubated at 22°C for 48 h.
Aquarapid-Va (Listonella (Vibrio) anguillarum from BIONOR A/S, Skien, Norway) was used following the manufacturer’s recommendations. Samples of kidney tissue (0.5±0.1 g) were immediately tested with the Aquarapid- Va kit. The sensivity and specificity of the test kit were evaluated according to the formulation reported by Rønning (1994). The Mono-Va agglutination kit was used to confirm the identification of the bacterial strains isolated from the diseased fish. Plates were incubated at 22 °C and colonies were isolated after 48 h on the media TSA-S and BHIA-S and further characterized by morphological, biochemical and enzymatic tests as previously described (Austin and Austin, 1999; Stavric and Buchanan, 1995; Baumann and Furniss, 1994). Antibiotic susceptibility test was performed using the disk diffusion method on Mueller-Hinton agar (Merck) described by Barry and Thornsberry (1985) and Bauer et al. (1966), except that 1% NaCl was used to prepare the media. Eigth or 10 colonies from BHIA-S incubated for 24 h at 22°C, were suspended in 2 ml of sterile 0.9% NaCl saline to a density equal to McFarland Opacity Standard No 0.5 (approximately cell density 1.5x108/ml). The bacterial suspension was inoculated onto Mueller-Hinton salt agar. Antibiotic discs (Oxoid, England) containing the folowing antibiotics: ampicillin 10 μg (AMP 10), c. sulphonamides 300 μg (S3 300), flumequine 30 μg (UB 30), kanamycin 30 μg (K 30), novobiocin 15 μg (NVB 15), oxolinic acid 2 μg (OA 2), penicilin G 10 iu (10 iu=6μg), tetracycline 30 μg (TE 30) and trimethoprime 5 μg (W 5) were dispensed on the surface of the medium and incubated for 24 h at 22°C. After this incubation, the diameters (in millimeters) of the complete inhibition zones of visible bacterial growth around each disc were measured and the results were recorded as resistant or susceptible according to the interpretive limits of the Clinical and Laboratory Standards Institute (NCCLS, 2003). Excised pieces of tissues from skin, muscle, gills, spleen, liver, kidney, stomach and intestine were fixed in 10% buffered formalin solution containing 1% NaCl within 48 h after necropsy. The tissues were dehydrated in an ethanol series, infiltrated and embedded in parafin wax and sectioned on a microtome at 5 μm. Tissue sections (5 μm thick) were stained with Meyer’s haematoxylin and eosin as described by Bullock (1989) and Coolidge and Howard (1979). European sea bass (D. labrax) is one of the most economically important fish species in the Mediterranean region (Varsamos et al., 2006; Afonso et al., 2005). Vibriosis is reported among the bacterial diseases affecting sea bass farming (Toranzo et al., 2005; Pujalte et al., 2003; Zorrilla et al., 2003b; Botella et al., 2002; Dos-Santos et al., 2001; Pedersen et al., 1997; Bakrouf et al., 1995; Santos et al., 1995; Myhr et al., 1991; Dec et al., 1990). Vibriosis is characterized by dark skin, pale gills, haemorrhagic areas near the mouth and on the base of fins, exopthalmia, corneal opacity and ulcers on the skin surface. Internally, moribund fish show severe anaemia and have haemorrhage in the abdominal fat, kidney and liver (Toranzo et al., 2005; Zorrilla et al., 2003a; Austin and Austin, 1999; Le Breton, 1999; Company et al., 1999; Alvarez et al., 1998; Balebona et al., 1998; Cagırgan and Yurekliturk, 1996). The clinical features of moribund sea bass affected by Vibrio outbreaks are given in Table 1. Necropsy findings of these fish included haemorrhage in the liver, air bladder and intestinal wall, pale kidney and liver, ascites in the body cavity, yellowish-bloody fluid in the intestine, enlarged spleen and empty stomach. These results were similar to clinical and necropsy findings reported by the above mentioned authors. However, in this study, the corneal opacity in the diseased fish affected with the different Vibrio species was not observed. Vibrio is one of the most important bacterial genera in aquaculture (Vandenberghe et al., 2003). Some species such as L. anguillarum, V. harveyi, V. alginolyticus and V. ordalii have been characterized as fish pathogens (Company et al., 1999; Balebona et al., 1998; Lee et al., 1996) as well as crustaceans and bivalve molluscs species (Alvarez et al., 1998; Bolinches et al., 1986; Bowser et al., 1981), some species e.g. V. alginolyticus have been reported as probionts (Gomez-Gil et al., 2000). Members of Vibrio genus are fermentative, motile, oxidase positive and sensitive to 0/129 Vibriostat test (150 μg) (Austin and Austin, 1999; Baumann and Furniss, 1994; Baumann and Schubert, 1984). Among L. anguillarum isolates, total of 23 serotypes (O1-O23, European serotype designation) were reported (Pedersen et al., 1999). However, only serotype O1, O2 and also O3 have been associated with losses of fish throughout the world (Toranzo et al., 2005). V. ordalii has been formerly classified as L. anguillarum biotype 2 (Schieve and Crosa, 1981). However, Actis et al. (1999) reported that V. ordalii had different properties such as phenotypic and genotypic characters. L. anguillarum, a Gram-negative, facultatively rod-shaped bacterium, gives positive reaction to the arginine dihydrolase test and uses citrate. This species is ONPGpositive. V. ordalii strains are arginine dihydrolase negative and do not use citrate. The strains are also ONPG-negative. V. harveyi strains are Gram-negative motile rods that are oxidase positive, Voges-Proskauer negative, lysine decarboxylase and ornithine decarboxylase positive, ONPG-negative and urease negative (Gauger and Gomez-Chiarri, 2002; Austin and Austin, 1999; Balebona et al., 1998; Alsina and Blanch, 1994). The phenotypic characteristics of Vibrio species isolated from moribund sea bass are shown in Table 2. The isolated strains had similar phenotypic properties to other Vibrio species reported by Austin and Austin (1999), Balebona et al. (1998), Baumann and Furniss (1994) and Baumann and Schubert (1984). Therefore, the isolated strains were identified as L. anguillarum, V. ordalii and V. harveyi. Traditional bacteriology is appropriate for the detection of common and easily cultured pathogens, however, these methods can be time-consuming (Adams, 2004). The development of diagnostic procedures applicable under field conditions has improved the accuracy and the time required for diagnosis of fish species (Gonzalez et al., 2004). BIONOR AS has developed different systems for example Aquarapid kit and Mono agglutination kit for the detection of fish pathogens. Aquarapid kits reduce the diagnosis and identification times of bacterial pathogens and their resultant diseases (Magariños et al., 1996). In field studies, the Aquarapid-Va kit produced positive results for L. anguillarum and V. ordalii and negative for diseased fish infected with V. harveyi. The sensivity and specifity of the kit were 1.0 and 1.0, respectively. Therefore, as Rønning (1994) suggested, the Aquarapid-Va kit was able to identify L. anguillarum and V. ordalii. The L. anguillarum strain agglutinated in the Mono- Va agglutination test kit for L. anguillarum. No agglutination was observed between the test and control reagents of this kit when the kit was applied to other members of the Vibrionaceae family such as V. ordalii, V. harveyi in agreement with the findings of Romalde et al. (1995). The most effective chemicals to vibriosis treatment were ampicillin, flumequine, furazolidone, oxolinic acid, sulphamethazine and nitrofurantoin (Soffientine et al., 1999; Balebonaet al., 1998). The isolated Vibrio species in our study were sensitive to six of the nine antibiotics tested: flumequine, kanamycin, novobiocin, oxolinic acid, penicilin G and tetracycline. V. ordalii strains were sensitive to ampicillin whereas it was not observed in the other Vibrio strains. However, all the isolates were resistant to c. sulphonamides and trimethoprime. Examination of tissue sections from moribund fish (230-250 g) infected with V. ordalii showed following changes. The kidney was severely affected, displaying necrosis in renal tubules. In the spleen, massive deposition of haemosiderin in the melano-macrophage centres was observed. In addition to these findings, vacuoler degeneration in the liver and haemorrhage in the pericardium (Figure 1) were found. However, there were no histological changes in the intestinal mucosa of the infected fish. Fig. 1: Haemorrhage (arrowed) in the pericardium of fish infected with V. ordalii, Haemotoxylin and Eosin x 500. The histology of diseased fish (85-140 g) from which L. anguillarum was isolated showed severe depletion of haemopoietic cells, deposition of haemosiderin in the spleen and peritubular vacuolar degeneration or liquefactive necrosis in the renal tubules. Haemorrhage and cellular inflammatory infiltration were observed The histology of diseased fish (85-140 g) from which L. anguillarum was isolated showed severe depletion of haemopoietic cells, deposition of haemosiderin in the spleen and peritubular vacuolar degeneration or liquefactive necrosis in the renal tubules. 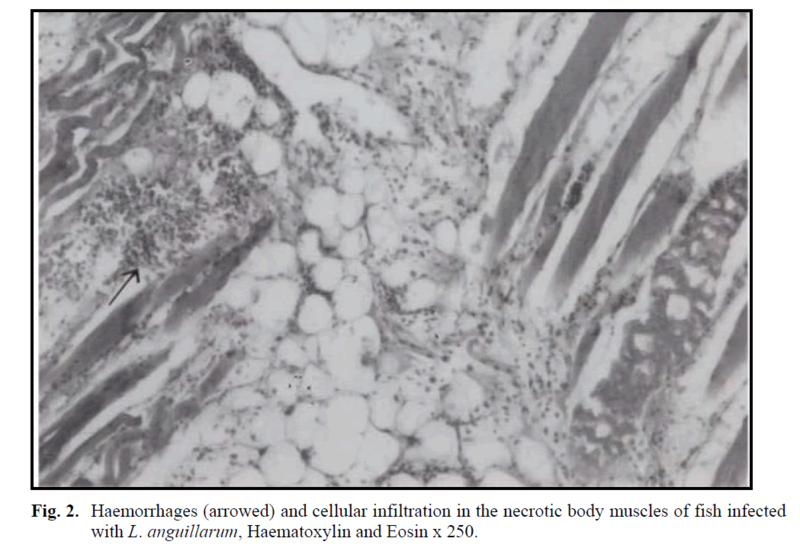 Haemorrhage and cellular inflammatory infiltration were observed in the necrotic lateral musculature under the haemorrhagic skin lesions (Figure 2). Haemorrhage was also seen in liver (Figure 3), gills and the propria mucosa of the skin. Fig. 2: Haemorrhages (arrowed) and cellular infiltration in the necrotic body muscles of fish infected with L. anguillarum , Haematoxylin and Eosin x 250. Fig. 3: Haemorrhages and vacuoler degeneration in the liver of fish infected with L. anguillarum, Haematoxylin and Eosin x 1000. The histological changes in moribund fish (2-5 g) infected with V. harveyi from two farms showed similar changes observed in the other affected fish infected with other Vibrio spp. consisted that liquefactive necrosis in the renal tubules and interrenal haemopoietic tissue and depletion of haemopoietic tissue in the kidney and necrosis in the gill filamantens. In addition to these findings, intestinal mucosa membrane was found necrotic and sloughed into the lumens. The histopathology of Vibrio spp. infected fish bore similarities to that observed in sea bass by other workers (Stephens et al., 2006; Agius and Roberts, 2003; Tendencia, 2002; Ransom et al., 1984) with the most striking similarities such as large reduced areas of haemopoietic tissue and deposition of haemosiderin in the melano-macrophage centres in the spleen, vacuoler degeneration or necrosis of tubule epithelium and haemorrhages in some glomerulus in the kidney, or liquefactive necrosis in renal and interrenal haemopoietic tissues. However, intestinal mucous membrane was found necrotic and sloughed into the lumens only in juvenile fish infected with V. harveyi and also there were no depositions of haemosiderin in the liver of the moribund fish affected with V. ordalii, L. anguillarum and V. harveyi. In controlling of vibriosis, vaccine is an effective protective measurement (Myhr et al., 1991). Fish in marine aquaculture are usually vaccinated against vibriosis sourced from L. anguilarum (Angelidis, 2006; Le Breton, 1999; Pedersen et al., 1997). In many countries, vaccines procedures have induced number of disease outbreaks from this species (Pedersen et al., 1997; Myhr et al., 1991). However, this case has affected that other Vibrio species caused infections in fish (Pedersen et al., 1997; Myhr et al., 1991). Futhermore, it was reported that different Vibrio species were isolated from the vaccinated fish (Myhr et al., 1991). In Turkey, vibriosis vaccines have been introduced since 1990s (Cagırgan, 2004) and employed containing antigen preparations of L. anguillarum serotypes I & II and V. ordalii. The above mentioned explanations may be an answer why different Vibrio species isolated in this study. 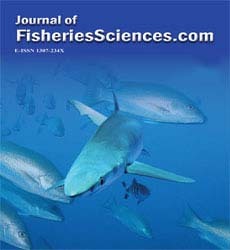 In conclusion, the aetiological agents of vibriosis outbreaks in the European sea bass cultured in four different farms located in the Aegean region of Turkey were identified and the histological changes produced by naturally acquired infections of L. anguillarum, V. ordalii and V. harveyi in the moribund fish were examined in this study. This work was a part of thesis of doctorate and supported by the Research Fund of the University of Istanbul, Project Number: T-4/23072002. Actis, L. A., Tolmasky, M. E., Crosa, J. H. (1999). Vibriosis in Woo, P. T. K., Bruno, D. W., ed., Fish Diseases and Disorders, vol. 3., CAB Intern., Publ., United Kingdom. Adams, A. (2004). Immunodiagnostic in aquaculture.Bulletin of the European Associationof Fish Pathologists, 24(1): 33-37. Afonso, A., Games, S., da Silva, J., Marques,F., Henrique, M. (2005). Side effects in seabass (Dicentrarchuslabrax, L.) due to intraperitonealvaccination against vibriosisand pasteurellosis, Fish & Shellfish Immunology,19: 1-16. Agius, C., and Roberts, R. J. (2003).Melanomacrophagecentres and their role in fishpathology, Journal of Fish Diseases, 26:499-509. Alsina, M. and Blanch, A. R. (1994). Improvementand update of set of keys for biochemical identification of enviromentalVibriospecies. Journal of Applied Bacteriology,77: 719-721. Alvarez, J. D., Austin, B., Alvarez, A. M. andReyes, H. (1998).Vibrio harveyi: a pathogenof penaeid shrimps and fish in Venezuela.Journal of Fish Diseases, 21: 313-316. Angelidis, P. (2006). Immersion booster vaccinationeffect on sea bass (DicentrarchuslabraxL. ), Journal of Animal Physiologyand Animal Nutrition, 90: 46-49. Austin, B., and Austin, D. A. (1999).FishPathogens Disease in Farmed and Wild Fish, 3rd ed. (revised), Praxis Publ., Chiester,UK. Bakhrouf, A., Ouada, H. B. and Oueslati, R.(1995). Sea bass Dicentrarchuslabraxvibriosistreatment in a pisciculture area inMonastir, Tunisia, Marine Life, 5(2): 47-54. Balebona, M. C., Zorrilla, I., Morinigo, M. A.and Borrego, J. J. (1998). Survey of bacterialpathologies affecting farmed gilt-head sea bream (Sparusaurata, L.) in southwesternSpain from 1990 to 1996.Aqauculture,166: 19-35. Barry, A. L. and Thornsberry, C. (1985).Susceptibilitytests: diffusion test procedures.Manual of Clinical Microbiology, 4 th ed.,Washington. Bauer, A. W., Kirby, W. M., Sherris, J. C. andTurck, M. (1966).Antibiotic susceptibilitytesting by a standardized single discmethod.American journal of ClinicalPathology, 45: 493-496. Williamd and Wilkins, Baltimore.Baumann, P. and Schubert, R. H. W. (1984).Family II.Vibrionaceae, Veron 1965, inKrieg, N. R..,ed, Bergey’s Manual of SystematicBacteriology, Williamd and Wilkins,Baltimore. Bolinches, J., Toranzo, A. E., Silva, A., andBarja, J. L. (1986).Vibriosis as the maincausative factor of heavy mortalities in theoyster culture industry in NortwesternSpain.Bulletin of the European Associationof Fish Pathologists, 6: 1-4. Bowser, P., Rosenmark, R. and Reiner, C. R.(1981).A preliminary report of vibriosis incultured American lobsters, Homarusamericanus.Journal of Invertebrate Pathology,36: 80-85. Botella, S., Pujalte, M., Macián, J. and Garay,E. (2002). Amplified fragment lengthpolymorphism (AFLP) and biochemicaltyping of Photobacteriumdamselaesubsp.damselae. 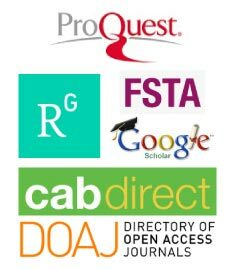 Journal Applied ofMicrobiology, 93(4): 681-688. Bullock, A. M. (1989).Laboratory Methods, inRoberts, R. J., Fish Pathology, BailliereTindall, London, UK. Cagirgan, H. (2004). Vaccine development insea bass fry (DicentrarchuslabraxL. 1758) against vibriosis.E. U. Journal ofFisheries & Aquatic Sciences, 21(3-4):271-274. Cagirgan, H. and Yurekliturk, O. (1996).Aresearch on the diagnosis and treatment ofcultured sea bream (SparusaurataL.) andsea bass (Dicentrarchuslabrax).The Journal of Centre Veterinary Control andResearch Institute, 21(35): 113-122. Colorni, A., Paperna, I. and Gordin, H. (1981).Bacterial infections in gilt-head sea breamSparusauratacultured at Elat, Aquacuture,23: 257-267. Coolidge, B. J. and Howard, R. M. (1979).Animal Histology Procedures, National Instituteof Health, Maryland, USA. Company, R., Sitjo-Bobadilla, A., Pujalte, M.J., Garay, E., Alvarez-Pellitero, P. andPérez-Sánchez, J. (1999). Bacterial andparasitic pathogens in cultured commondentex, Dentexdentex, Journal of FishDiseases, 22: 299-309 . Dec, C., Angelidis, P. and Baudin Laurencin,F. 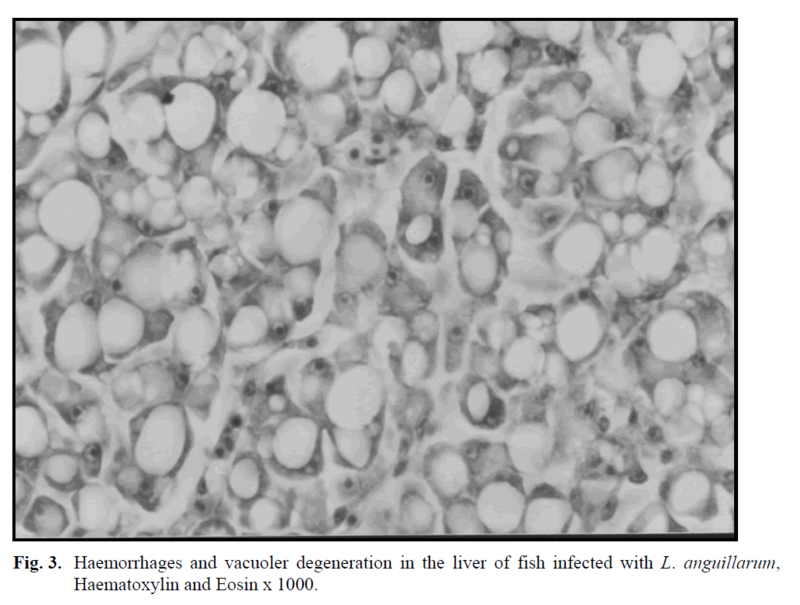 (1990).Effects of oral vaccinationagainst vibriosis in turbot, Scophthalmusmaximus(L.) and sea bass, Dicentrarchuslabrax(L.).Journal of Fish Diseases,13(5): 369-376. Demircan, D., and Candan, A. (2006). Identificationof Vibrio anguillarumby PCR(rpoNGene) associated with vibriosis inmarine fish in Turkey. Turkish Journal ofVeterinary and Animal Sciences, 30: 305-310. Dos Santos, N. M. S., Taverne-Thiele, J. J.,Barnes, A. C., Ellis, A. E., and Rombout,J. H. W.M. (2001). Kinetics of juvenile seabass (Dicentrachuslabrax, L.) systemicand mucosal antibody secreting cell responseto different antigens (Photobacteriumdamselaesubsp. piscicida, Vibrio anguillarumand DNP), Fish & Shellfish Immunology,11: 317-331. Gauger, E. J., and Gómez-Chiarri, M. (2002).16 S ribosomal DNA sequencing confirmsthe synonymy of Vibrio harveyiand Vibriocharchariae. Diseases of AquaticOrganisms, 52: 39-46. Ghittino, C., Latini, M., Agnetti, F., Panzieri,C., Lauro, L., Ciappelloni, R. and Petracca,G. (2003).Emerging pathologies in aquaculture:effects on production and foodsafety.Veterinary Research Communications,27(1): 471-479. 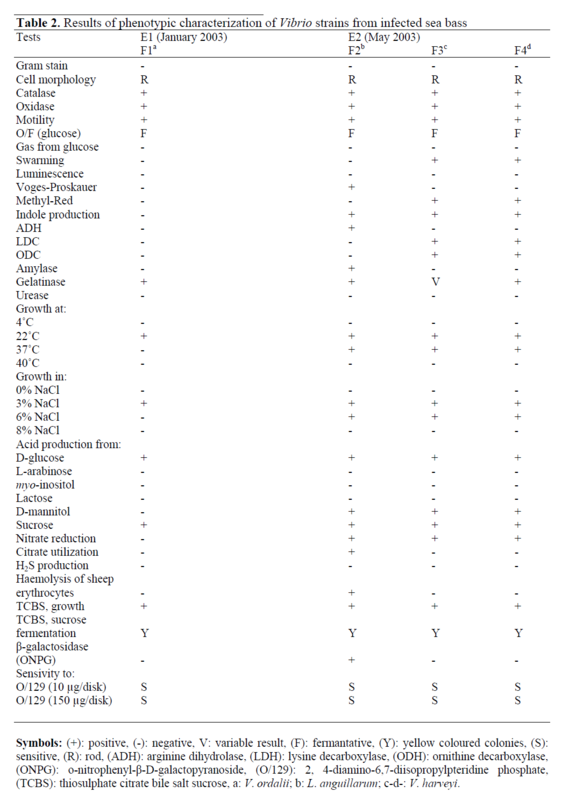 Gomez-Gil, B., Roque, A., Turnbull, J. F.(2000).The use and selection of probioticbacteria for use in the culture of larvalaquatic organisms.Aquaculture, 191: 259-270. Gonzalez, S. F., Osorio, C. R., Santos, Y.(2004). Evaluation of the Aquarapid-Va,Aquaeia-Va and dot blot assays for thedetection of Vibrio anguillarumin fish tissues.Journal of Fish Diseases, 27: 617-621. Korun, J. and Gokoglu, M. (2007).Listonellaanguillarumisolated from hatchery-culturedred porgy Pagruspagrusin Turkey.Journal of Animal and Veterinary Advances,6(6): 823-827. Lee, K. K., Yu, S. R., Chen, F. R., Yang, T. I.,Liu, P. C. (1996). Virulence of Vibrioalginolyticusisolated from diseased tigerprawn, Penaeusmonodon. Current Microbiology,32: 229-231. Li, J., Yie, J., Foo, W. T., Ling, J. M., Xu, H.,Woo, N. Y. S., 1999. Antibiotic resistanceand plasmid profiles of Vibrio isolatesfrom cultured silver sea bream, Sparussabra.Marine Pollution Bulletin, 39(1-12): 245-249. Breton, Le A. D. (1999). Mediterranean finfishpathologies: present status and newdevelopments in prophylactic methods.Bulletin of the European Association ofFish Pathologists, 19(6): 250-253. Magarinos, B., Toranzo, A. E. and Romalde, J.L. (1996).Phenotypic and pathobiologicalcharacteristics of Pasteurellapiscicida.Annual Review of Fish Disease, 6: 41-64. Myhr, E., Larsen, J. L., Lillehaug, A., Gudding,R., Heum, M. and Håstein, T. (1991).Characterization of Vibrio anguillarumand closely related species isolated fromfarmed fish in Norway. Applied and EnviromentalMicrobiology, 57(9): 2750-2757. NCCLS, (2003).Performance standards forantimicrobial disc susceptibility tests: approvedstandard, National Committee forClinical Laboratory Standard ofAntimicrobial Susceptibility, DocumentM2-AS, Pennsylvania, USA. Pedersen, K., Dalsgaard, I. and Larsen, J. L.(1997).Vibrio damselaassociated withdiseased fish in Denmark. Applied and EnviromentalMicrobiology, 63(9): 3711-3715. Pedersen, K., Austin, B., Austin, D. A. andLarsen, J. L. (1999).Vibriosis associatedwith mortality in cultured plaice Pleuronectesplatessafry. Acta VeterinaryScandinavia, 40: 263-270. Pujalte, M. J., Sitjà-Bobadilla, A., Maclán, M.C., Belloch, C., Álvarez-Pellitero, P.,Pérez-Sánchez, J. Uruburu, F. and Garay,E. (2003). Virulence and molecular typingof Vibrio harveyistrains isolated fromcultured dentex, gilthead sea bream andeuropean sea bass. Systematic AppliedMicrobiology, 26(2): 284-292. Ransom, D. P., Lannan, C. N., Rohovec, J. S.And Fryer, J. L. (1984). Comparison ofhistopathology caused by Vibrio anguillarumand Vibrio ordaliiin three species ofPacific salmon, Journal of Fish Diseases,7: 107-1115. Romalde, J. L., Magarinos, B., Fouz, B.,Bandin, I., Núnez, S. and Toranzo, A. E.(1995).Evaluation of Bionor Mono kits forrapid detection of bacterial fish pathogens.Diseases Aquatic Organisms, 21: 117-119. Rønning, O. (1994). Evaluation of Bionoraquarapid test kits, SINTEF IndustrialChemistry, STF 27, F 944026. Santos, Y., Pazos, F., Bandin, I. and Toranzo,A. E. (1995). Analysis of antigens presentin the extracellular products and cell surfaceof Vibrio anguillarumserotypes 01,02, and 03. Applied and Enviromental Microbiology,61(7): 2493-2498. Schieve, M.H. and Crosa, J.H. (1981).Molecular characterization of Vibrioanguillarumbiotype 2, Canadian Journalof Microbiology, 27: 1011–1018. Soffientino, B., Gwaltney, T., Nelson, D. R.,Specker, J. L., Manuel, M. and Gómez-Chiarri, M. (1999). Infectious necrozitingenteritis and mortality caused by Vibriocarchariaein summer flounderParalichthysdentatusduring intensiveculture. Diseases Aquatic Organisms, 38:201-210. Stavric, S. and Buchanan, B. (1995).The isolationand enumaration of Vibrio vulnificusfrom fish and seafoods.Laboratory ProcedureMFLP-73, Health Protection Branch,Ottowa, Canada. Stephens, F. J., Raidal, S. R., Buller, N. andJones, B. (2006).Infection with Photobacteriumdamselaesubspecies damselaeand Vibrio harveyiin snapper, Pagrusauratuswith bloat.Austrilian VeterinaryJournal, 84(5): 173-177. Tanrikul, T. T., Cagirgan, H., Toksen, E.(2004). Identification of isolated Vibrio sp.from sea bass (DicentrarchuslabraxL.1758) using API 20 E system.Ege UniversityFaculty of Fisheries Journal ofFisheries and Aquatic Sciences, 21: 243-247. Tendencia, E. A. (2002). Vibrio harveyiisolatedfrom cage-cultured sea bass LatescalcariferBloch in the Philippines. AquacultureResearch, 33: 455-458. Toranzo, A. E., Magarinos, B. and Romalde, J.L. (2005).A review of the main bacterialfish diseases in mariculture systems.Aquaculture, 246: 37-61. Vandenberghe, J., Thompson, F. L., Gomez-Gil, B., Swings, J. (2003). Phenotypic diversityamongst Vibrio isolates from marineaquaculture systems. Aquaculture,219: 9-20. Varsamos, S., Flik, G., Pepin, J. F., WendelaarBanga, S. E. and Brevil, G. (2006). Husbandrystress during early life stages affectsthe stres response and health status ofjuvenile sea bass, Dicentrarchuslabrax.Fish & Shellfish Immunology, 20: 82-96. Villamil, L., Figueras, A., Toranzo, A. E.,Planas, M., Novoa, B. (2003). Isolation ofhighly pathogenic Vibrio pelagusstrain associatedwith mass mortalities of turbot,Scophthalmusmaximus(L.), larvae. Journalof Fish Diseases, 26: 293-303. Yiagnisis, M., Vatsos, I. N., Kyriakou, C.,Alexis, M. (2007). First report of Vibrioanguillarumisolation from diseased bigscale sand smelt, AtherinaboyeriRisso1810, in Limnos, Greece. Bulletin of theEuropean Association of Fish Pathologists,27(2): 61-69. Zorrilla, I., Arijo, S., Chabrillon, M., Diaz, P.,Martinez-Manzanares, E., Balebona, M.andMorinigo, M. A. (2003a). Vibrio speciesisolated from diseased farmed sole,Soleasenegalensis(Kaup) and evaluationof the potential virulence role of their extracellular products. Journal of FishDiseases, 26: 103-108. Zorrilla, I., Moriñigo, M. A., Castro, D., Balebona,M. C., Borrego, J. J. (2003b). Intraspecificcharacterization of Vibrio alginolyticusisolates recovered from culturedfish in Spain. Journal of AppliedMicrobiology, 95: 1106-1116.